Note: What Node and Link Invert Elevations Does SWMM 5 Use? 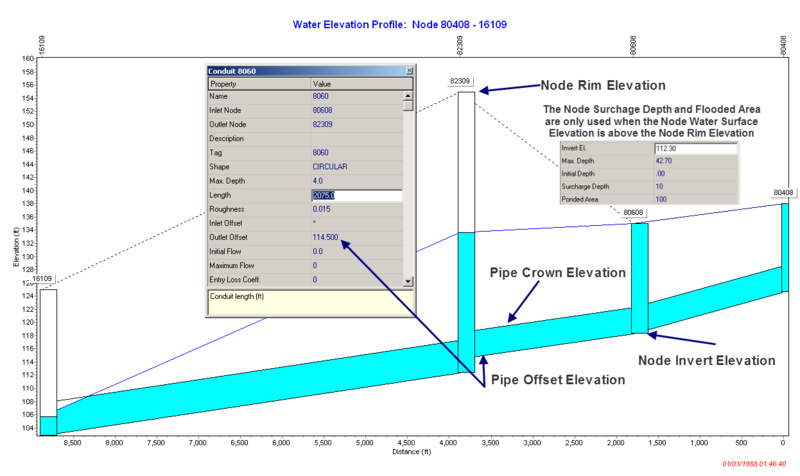 · The Pipe Crown Cannot be above the Rim Elevation of the Node – the program will raise the Rim Elevation when this happens and print a warning in the rpt file. The use of Offset Depth or Offset Elevation for the Link Offsets is based on the user choice at the bottom of the SWMM 5 GUI Map. Tagged as: What Node and Link Invert Elevations Does SWMM 5 Use? IO9- What really causes that amazing “after the rain” smell?